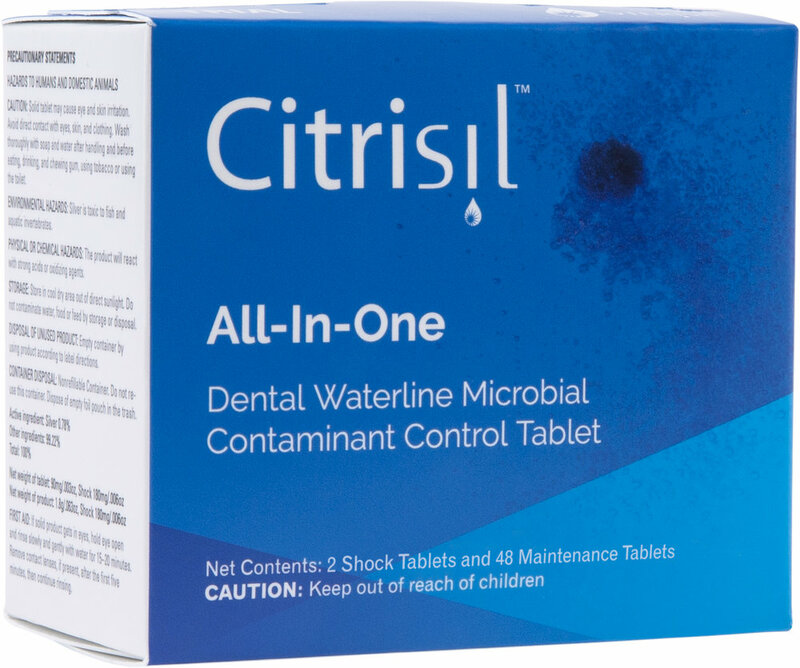 Citrisil tablets are an all-in-one, dental waterline maintenance tablet clinically proven to clean and maintain dental unit water lines. Simply start with one orange Citrisil shock tablet per the instructions for use and follow with one Citrisil maintenance tablet per bottle refill. Need a treatment indicator? Blue Citrisil tablets produce a light blue tint for visual confirmation of treatment. The new Sterisil Straw V2 eliminates the hassle of dropping daily tablets and provides worry-free waterline disinfection for 365 days! As an added bonus, the Straw has a built-in shock treatment which releases automatically to kill preexisting bacteria. The Sterisil Straw has a quantified EPA claim of ≤10 CFU/ml HPC purity and features a Luer Lock fitting, reducing installation and replacement time down to a minute. The Sterisil Valved Cartridge and Sterisil Inline Cartridge provide purified dental water and keep your directly plumbed lines virtually free of bacteria. Both Cartridges prevent hard water deposits and deliver continuous disinfection for dental unit water lines connected to city water. Sterisil Cartridges last up to 1 year depending on municipal water quality and volume of water used. One Cartridge per dental chair. The Sterisil System is a point-of-entry water purification system designed to easily connect with the municipal water supply. Engineered to provide treated dental water, distilled quality water and final rinse water. It requires no tablets or additional additives for daily dental water use. It works in six stages of treatment, including Class B Ultraviolet Irradiation disinfection. In short, the Sterisil System is the perfect solution for any dental facility! 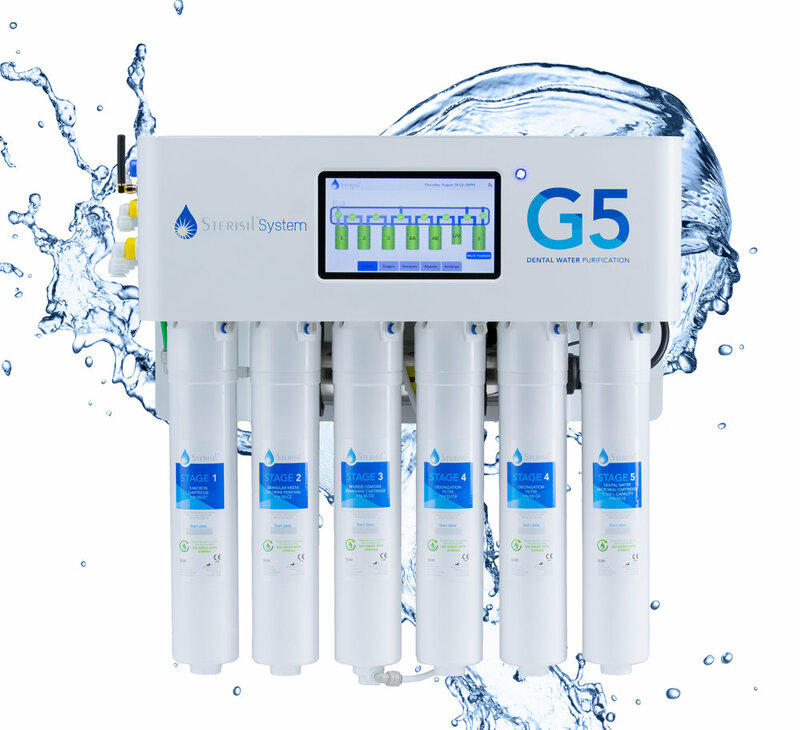 Equipped with a touchscreen, PC app, and a network of sensors, the G5 offers water quality monitoring and real time diagnostics for optimized dental water treatment. Save time, money and energy by avoiding the constant expense of buying distilled water. No more hauling around and storing bottles that clutter up your facility. The Ac and Ac+ Systems produce distilled quality water to 0ppm TDS for table top autoclaves and bottles. Conveniently fill up your autoclaves and bottles with purified water with the included table top faucet or the Sterisil Wand. Designed to be used with Sterisil dental water line treatment products to meet your ADA & CDC dental water compliance needs. Our expert team is waiting to hear from you.